You’ve been cruising along building your perfect app in PowerApps and all of a sudden, it’s not working or an error is thrown—we’ve all been there at some point. Not to worry, we are here to help. We’ll walk you through the common support scenarios of filing a support incident as well as letting us know about a potential bug. The first stop is the PowerApps Community. The Community is full of avid PowerApps users looking to assist others with their issues. 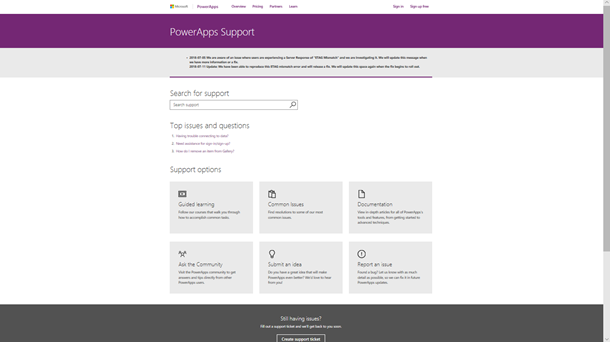 Additionally, the Community is actively monitored by the PowerApps Product Group as well. So, this is a great place to post your question and get help and at the same time offering others an opportunity to solve a similar problem. 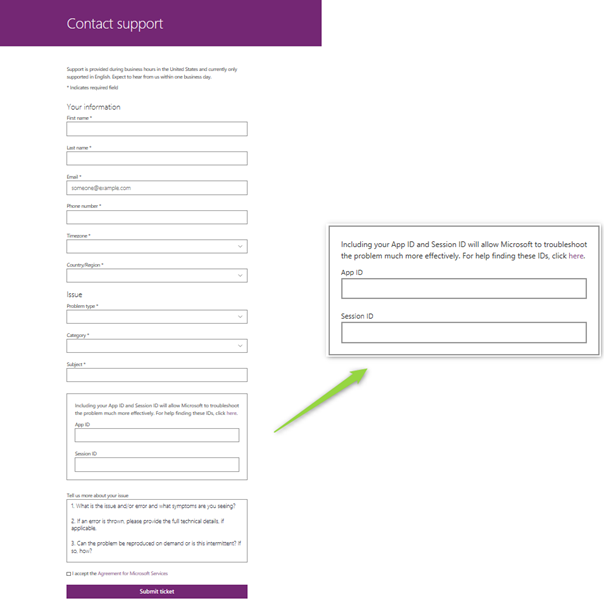 If you need more assistance directly from PowerApps Support, you can engage us by submitting an incident via our Contact Support form. Note that you will need to be logged in to access the form and submit your ticket. When submitting your support ticket, provide as much detail as possible including any error messages as well as Session ID and App ID. These details will ensure our Support Engineers have information to start troubleshooting your issue prior to contacting you, effectively speeding up the time to get your issue resolved. Once your ticket is received, Support Engineers will review the data provided and conduct initial research/troubleshooting, depending on the detail provided. You will receive an initial response from a Support Engineer within 8 business hours. This will be an introduction, confirmation of issue and request for additional information, if needed. Subsequent communications will continue via email or on the phone until a resolution has been provided. In the event your issue is too complex or requires service side support, the Support Engineer will reach out to the PowerApps Product Group. Though you will not be part of these interactions the Support Engineer will continue to communicate on the status of your issue. They may ask for additional information or provide steps to resolve the issue. Upon receiving a solution, you will be asked to test and verify the issue is resolved. When you confirm the issue has been resolved, either via email or on the phone, the Support Engineer will close the ticket. If you do not or cannot respond, our Support team will try to contact you two to three times prior to closing the ticket. If the issue arises again you can reopen the original request or create a new ticket referencing the previous ticket. You’ve double checked your formulas, connections, code, etc. and believe you’ve found a bug. Head over to the PowerApps Community and let us know. The PowerApps Product Group is on overwatch specifically for these situations. We’ll ask some clarifying questions to validate it’s a bug and if not will help you identify the cause. 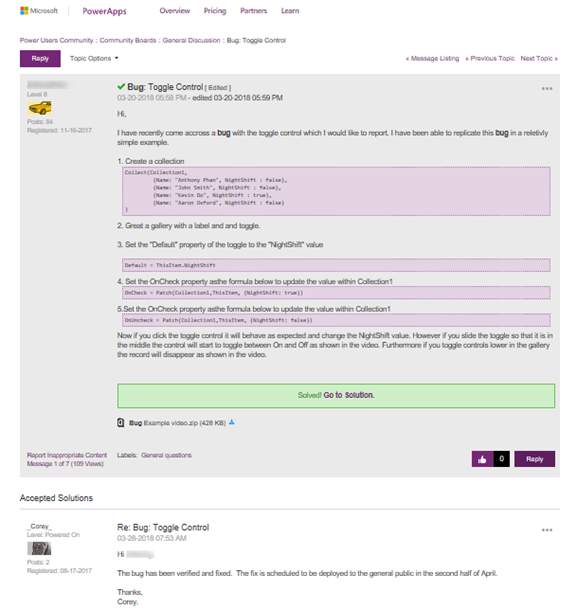 If it is a bug, we will document it internally, triage it and schedule a fix. Once we have an understanding of the fix and timing we’ll post back to the Power Apps Community for broad awareness. Similarly, if you have a great idea you’d like to share with us to improve PowerApps, you can post it to the PowerApps Ideas forum. Regardless if you are just starting out with PowerApps or are a PowerApps power user we thank you for your support and want you to know we are here to help you on your journey.